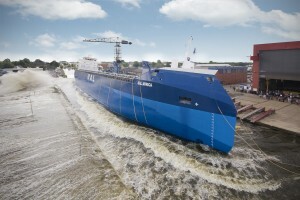 Royal Bodewes is a leading, modern shipyard group in the north of the Netherlands. Since the foundation in 1812 Royal Bodewes has focused on designing and building of ships in close contact with their clients based on the principles of quality, reliability and flexibility. The innovative approach of Royal Bodewes enable clients to have their specific demands realized. Royal Bodewes is specialized in building all kinds of vessels in a range from 2,000 to 14,000 DWT. Special types such as mini bulkers, bunker tankers, paper carriers, offshore vessels and workboats are also part of the competence. With the in-house team of naval architects, Royal Bodewes is capable to develop any kind of custom-built vessel. New demands in the market requested by clients and continuing changes in legislation, have created a philosophy within Royal Bodewes to design ships that are the best in terms of quality, environmental friendliness and last but not least cost efficiency.